Illustration by Ryan Rich and Jeffrey Pohanka. Racist. Resign. Impeach. These are the words being thrown around after a racist photo surfaced from the medical school yearbook page of Virginia Gov. Ralph Northam. Two men are in the 1984 photograph, one dressed in a Ku Klux Klan robe and the other in blackface. But Northam denies being either person in the photo, despite apologizing for appearing in it at first. Of all days, the photo leaked on the first day of Black History Month. Amid the bustling news cycle of 2020 election bids, the end of the government shutdown and controversial third-trimester abortions debates, all eyes are on Northam. I, like a lot of other Richmonders, voted for Northam not knowing this part of his past. And somehow, I didn’t even bat an eye when the photos surfaced. I wasn’t surprised. I’m never surprised when a white person has a racist past, if I’m being candid. But I understand the hurt and pain my fellow black community feels all too well — especially those who voted for Northam, trusted him and felt let down. But we can’t forget Americans elected a racist for president. If being racist was grounds for resignation or impeachment, Donald Trump would no longer run the country. Racism is beyond what we just observe with our eyes; it manifests itself in microaggressions, through legislation, and what we deem as “acceptable racism.” Allowing someone like Northam, or worse, in office condones racism as long as you give a half-baked apology. Protesters have been gathering at the Capitol since Friday, urging Northam to resign. Since the photo leaked, Northam’s actions point toward incomptemency, and his public relations team isn’t working hard enough to restore his image. Northam originally apologized for the yearbook photo for all the “hurt” it has caused. And in the same breath says it isn’t his photo; it was mistakenly placed on his yearbook page. But in his public apology at a bizarre press conference Saturday, he admitted to “darkening” his face with “a little bit” of shoe polish when he dressed up as Michael Jackson for a dance contest. But that wasn’t blackface, according to him. Northam couldn’t even remember Jackson’s name and probably would have moonwalked in front of dozens of reporters if his wife didn’t murmur “inappropriate circumstances” to him. 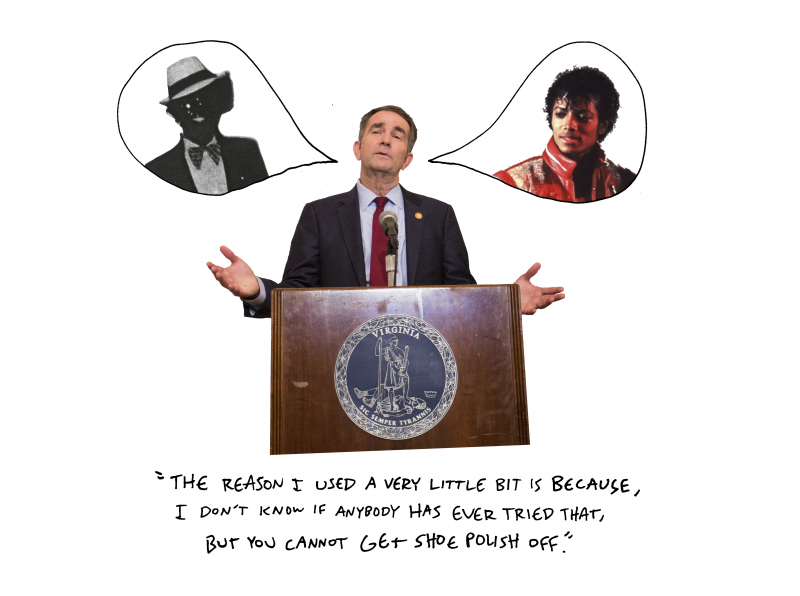 You can’t apologize for alleged blackface with confirmed blackface, governor. Northam’s refusal to resign is understandable — he doesn’t want to be painted as a racist for the rest of his political career and being called racist is obviously worse than being racist. But he can’t successfully lead Virginia when more than 20 percent of Virginians are black. His supporters have dwindled and many fellow Democrats have condemned him including former Virginia Gov. Terry McAuliffe, Richmond Mayor Levar Stoney and Lt. Gov. Justin Fairfax. Trump even called Northam’s actions “unforgivable,” but that’s the pot calling the kettle black. This photo is only 35 years old. Racism isn’t dead or a thing of the past — it’s looming over us, and that photo is a stark reminder of that fact. 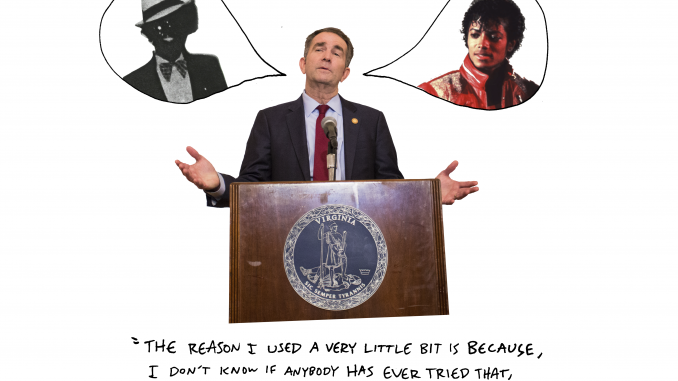 Whether Northam is the one in blackface or the one in the KKK robe, someone is in that photo and we should care just as much about their racist actions as our governor’s. Racism is never an accident, and when people who have committed racist actions are in positions of power, it furthers America’s already historically white supremacist power structure. As a piece of advice to Northam, take accountability for your actions and truly understand the weight they carry. Your pride shouldn’t get in the way of what’s best for Virginia. Virginians are taking a clear stance by protesting and condemning the governor they once campaigned so hard for.